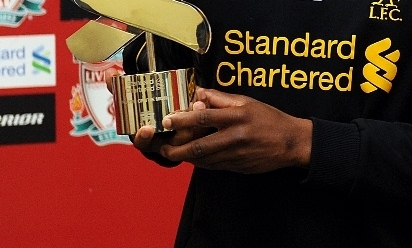 Daniel Sturridge's phenomenal performances last month have been duly rewarded with the Standard Chartered Player of the Month award for February, as voted by the club's fans. The 24-year-old turned in a series of typically lethal displays, beginning with Liverpool's only goal in the draw at West Bromwich Albion before adding another during the 5-1 rout over Arsenal. He then brought his team level en route to beating Fulham midway through the month and ensured the Reds concluded February with victory by notching a double as Swansea City were beaten 4-3. 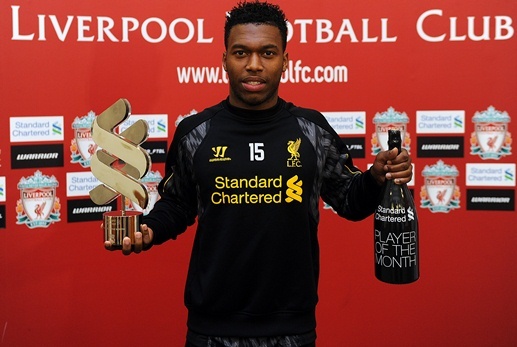 Such was Sturridge's prowess, that he collected the Barclays Premier League Player of the Month prize on Friday, shortly before confirmation that his own supporters had honoured him too. Having triumphed ahead of Steven Gerrard, Raheem Sterling and Luis Suarez in a poll on the club's official Twitter account, @LFC, the No.15 was presented with the award at Melwood yesterday. 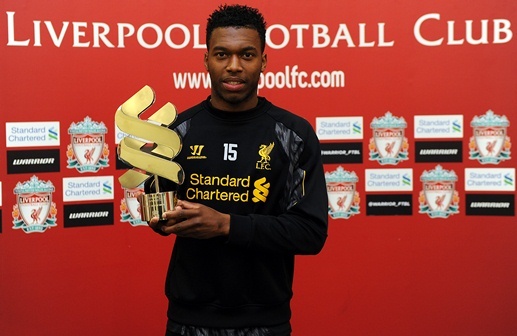 Upon receiving the trophy, Sturridge told Liverpoolfc.com of his gratitude to fans for their nomination: "It's amazing - I'm thankful to them for giving me the award. "It has been a good month for the team as well, with us being second in the Premier League. We're working hard every day and I'm working hard every day, trying to help the team get higher in the table. It's been a great month. "With the football we played, we showed everybody what we could do as a team. If we work hard as a team, anything is possible. The targets have always been to get into the Champions League. We'll continue to do that. "Of course, it would be great to win the Premier League and everybody wants to achieve that, but the target that was set was the Champions League. If we can achieve that, then everybody will be happy. "The fans were behind us in the games; they have been with us throughout the season and they have been the 12th man for us. We're thankful to them for the support they have shown." With 18 strikes in the Premier League to date this season, Sturridge is second only to teammate Luis Suarez in the scoring charts with 10 matches remaining on the schedule. The England international stressed the importance of the collective in providing a platform for the duo to thrive, though, and insisted that there is far more to come from him on a personal level. He added: "There's no competition between myself and Luis - it's about the team. It's about us winning games as a team and about everybody contributing. "These individual accolades are great to have but it's not about that. The team elevates us and without the team, we would just be two individuals that can't do anything. Without them, it wouldn't be possible; the team comes first, it's not about us. "The fans have not seen the best of me, definitely not - there's a lot more to come. I'm still improving. It has been my first full season, so I think I'm only going to get better. I can't wait to continue to improve."